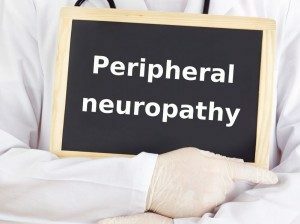 Neuropathy is a collection of disorders that occurs when nerves of the peripheral nervous system (the part of the nervous system outside of the brain and spinal cord) are damaged. The condition is generally referred to as peripheral neuropathy, and it is most commonly due to nerve axons damage. 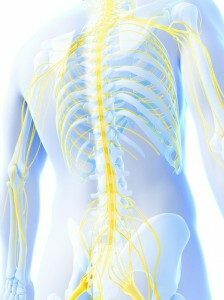 The peripheral nervous system connects the muscles, skin, and internal organs to the spinal cord. If there is damage to the connection, you can experience immobility and pain. Neuropathy usually causes pain and numbness in the hands and feet. It can result from traumatic injuries, infections, metabolic disorders, and exposure to toxins. One of the most common causes of neuropathy is diabetes. Neuropathy affects nerves that control muscle movement and those that detect sensations such as coldness or pain (sensory nerves). In some cases – autonomic neuropathy – affects internal organs, such as the heart, blood vessels, bladder, or intestines. Pain from peripheral neuropathy is often described as a tingling or burning sensation. There is no specific length of time that the pain exists, but symptoms often improve with time – especially if the neuropathy has a curable underlying condition. Often thought of in-conjunction with bad nutrition and other diseases, this condition actually has no known reason (idiopathic neuropathy). In the United States, almost 20 million people suffer from neuropathy. Over half of patients with diabetes also suffer from the condition. At Spring Creek Medical Center, our Team of Experts in neuropathy help you recover quickly. The medical doctor, chiropractor, and physical therapist work together and make a solid team to help you recover from any type of nerve condition.